comScore just released the May web property ratings for the U.S., and Technorati Media's premium social media network was named the fourth largest social media property. We launched Technorati Media almost two years ago, and since then, we've grown into the largest social media ad network. Congrats and thanks to our cooperative of blogs and niche social network partners for helping us grow -- woo hoo!! 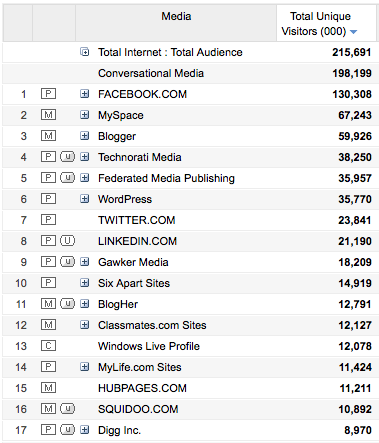 Note: Technorati Media's audience is actually substantially larger than this comScore property measurement. comScore's calculation only counts sites that have assigned their traffic to Technorati Media for their marketing purposes. 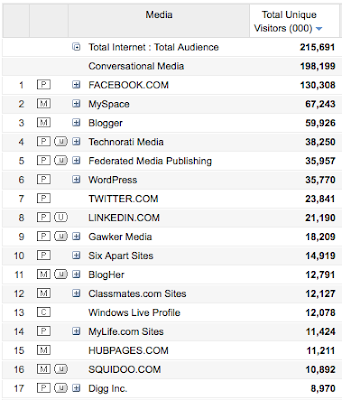 We work with many other sites as well, and in April 2010, over 248 million people worldwide saw Technorati ads.